I recently came across the following interview with a German artist, Benjamin Harff, who, as part of his examination at the Rhein-Sieg-Akademie für realistische bildende Kunst und Design, illuminated a deluxe edition of J.R.R. Tolkien's The Silmarillion. So then, why do I mention this here on NLM? 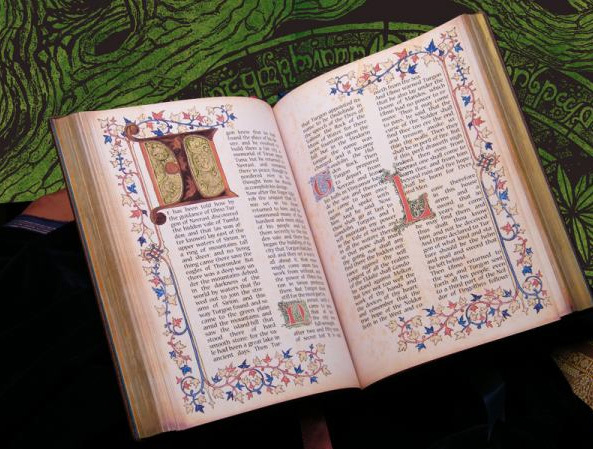 Well it is rather simple: to show the potentialities that can and yet do indeed still exist in the area of the book arts -- something which I think we often assume today to be impossible or impractical. 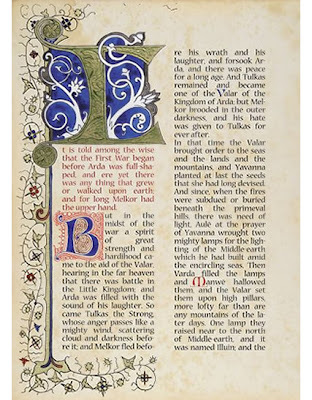 When I saw this project, and read about this artist's pursuits, a pursuit he made for reason of his examination and his passionate interest in Tolkien's writings, what immediately sprang to mind was how something of this sort could be commissioned as part of a Missal illustration and design project -- or for that matter, any liturgical publishing project. Evidently what I am speaking of is not necessarily particular to the medieval style of illumination shown here, for certainly there are also other possible manifestations including those of a more "other modern" variety. 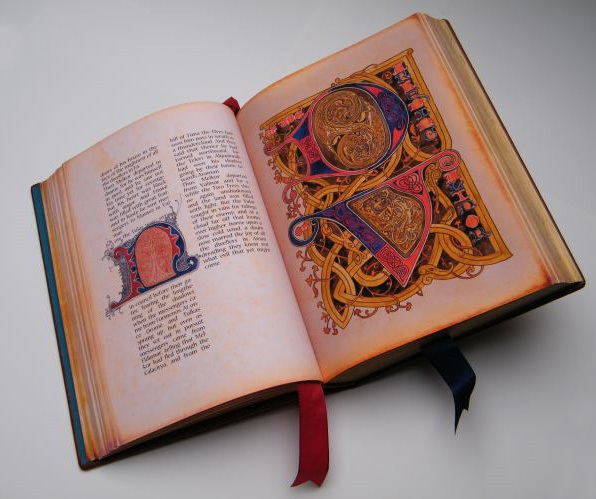 Instead my point is to highlight the potentialities generally for hand-crafted designs, from carpet pages to illuminated capitals, today; original designs specific to the contents of the book in question, and specifically crafted with the book in mind. Surely if one artist can accomplish this for the reasons noted above, the same or greater is not unrealistic or out of reach for us in relation to the sacred liturgy and liturgical books of the Church.